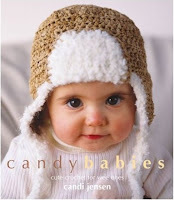 "Candy babies: Cute crochet for wee ones"
It seems strange to be coming back to this book again - I gave away my original copy years ago (before I was writing this blog) over on Crochetville. This was one of my early online craft book purchases where I would just order based on the cover photo instead of trying to find out a bit about what the book contained first (Ravelry is a great place to check before you buy, you can search out the book on there and see what patterns it contains as well as have a peek at what other people have made and if they had any problems). Nothing in this book appealed to me back then and so I gave my copy away a few years later and forgot about it. Seeing as my lovely crochet book collection is currently in a storage container somewhere I had a rifle through my local library for any suitable baby crochet books and this is the only one that was half decent (can anyone please recommend some good titles for baby crochet?). On second inspection I did find one pattern that I thought would be worth a go - the Party Princess one, so after a quick trip to a local yarn store I started work. Seeing as I haven't been doing much in the way of crochet my brain seems to have stopped working correctly as it took me over 3 hours to figure out that my gauge was horribly wrong because I was using the wrong yarn weight - I had bought DK instead of the worsted weight that the pattern calls for. After realising this I had to rework the pattern to account for the finer yarn and thankfully this was possible with a bit of tweaking due to the pattern having the finished measurements marked up. The instructions were clear and it was a simple pattern to follow so I ended up enjoying making this item. So perhaps a book worth looking at - but I would strongly recommend you have a browse through it first to make sure you like the patterns it contains first, for me it still isn't one I would buy but I am glad that I gave it a second chance. Im hoping I get a crafty stash this birthday as my library has rubbish craft books!